Dan P. Lehon Holds Conference With Solicitor General Hugh Dorsey and Other Officials and Then Makes Announcement of Severance of Connection With Case. “One of the Girls” in the Pencil Factory Brings Statement to The Constitution Defending the Character of Employees — Bribery Attempts Are Denied. As a startling climax to the sensational turn of affairs in the Mary Phagan murder investigation, it was announced yesterday by Dan P. Lehon, superintendent of the Burns southern offices, that his agency had retired from the investigation of the Atlanta mystery. The announcement was made after a conference he held for several hours with Solicitor General Hugh M. Dorsey and other officials promoting the investigation. C. W. Tobie, chief of the Burns criminal department, who has been in command of the Burns men at work on the case, leaves for Chicago this morning. Tobie was seen last night by a reporter for The Constitution in his apartments at the Piedmont hotel. He was preparing to leave the city, but spared time to give the newspaper man a statement regarding the departure of the Burns forces and their attitude in the Mary Phagan case. General Superintendent Lehon, he said, left Atlanta Monday afternoon. “The connection of the William J. Burns agency with the Phagan case,” he told the reporter, “is now severed entirely. We have nothing whatever to do with the investigation. When these bribery charges were published I immediately notified Dan Lehon, general superintendent of the southern branches of our organization. “What is the principal reason for your severance of connection?” he was asked. “Primarily, because, in the face of open opposition and efforts to frustrate our work, we cannot successfully operate,” he said. “We cannot render service proportionate to the money we are being paid. It is being insinuated by certain forces that we are striving to shield Frank. Tobie said the bribery charges of Chief Lanford and the counter charges were unfortunate, in that they create a situation which deplorably hampers the investigation of the murder. The Burns agent also declared his belief in Colonel Felder’s sincere and honest attitude in the Phagan case. He said the attorney had employed his agency only to apprehend the slayer, and that upon his arrival in Atlanta, he had been told by Felder that, from all appearances, Frank was guilty. He stated, too, that he had never exerted a single effort toward investigating alleged corruption in the police or detective department, and that he had never anticipated doing so. Colonel T. B. Felder, foremost figure in the bribery charges and counter charges of police corruption, would make no statement to reporters Monday. He would not commit himself on Lehon’s statement that the Burns men had detached themselves from the Phagan investigation. Mr. Felder says, however, that his individual investigation would continue as in the past, and that he had no intention whatever of ending his efforts. Not until he deems it seasonable, he declares, will he issue additional statements to the newspapers. Lehon came from New Orleans Monday in answer to instructions given, it is said, from his New York office, sending him to investigate the Atlanta situation. He immediately conferred with the solicitor general and others. The indictment of Leo Frank has not served to lessen in the slightest the energy of the police headquarters detectives, the Pinkerton men and the solicitor general’s staff. Chief Lanford and Harry Scott, of the Pinkertons, both say that they each unearthed evidence sufficient to convict the suspected superintendent. No new developments arose Monday. Frank maintains his attitude of silence, refusing to see anyone besides his friends and relatives. A stranger greeting him in his cell at the Tower gets only a fleeting glimpse of the prisoner. Strong denial is made, however, of rumored bribery attempts to pay witnesses for the prosecution to leave the city. These denials are made by attorneys representing the suspect. Another denial of a published report was made Monday by Colonel Felder, who declared that the rumor of this elimination from the Phagan case was false to the core, and that his efforts, instead of slacking, would continue with renewed vigor. It was published that Mr. Felder is eliminated entirely from the case, and that, up until the time he had begun to “bombard” the public with statements of his belief of Frank’s guilt, it was generally believed he was in the suspect’s employ. Complete denial is made of this report. “I wish to speak in behalf of our factory and the girls working there and would like for the public to know that we all thought just as much of little Mary Phagan as we possibly could, and are just as anxious to see the guilty punished as the rest of the public. “Nothing was ever said about the girls of the National Pencil factory until after the terrible murder, but since, there has been one continual talk just as though we were to blame for the deed. “If the public would only interest themselves enough to look into other factories and stores, they would soon find that the girls of the National Pencil factory are just as good as any other set of working girls in the city. “Of course, it looks rather hard to the public for us to have to work in the building where one of our companions was so horribly murdered. But, even at that, we are all poor girls, trying to make an honest living and we try not to think of the grewsome tragedy any more than possible, and we have the interest of the company too much at heart to desert them in times of trouble. “We try to look on the bright side of this trouble, and hope it will be only a few days until everything will be all right once more. We all hope and pray that the guilty will be duly punished and the innocent given their freedom, for we all feel that our superintendent was and still is a soul himself so much as to think of such a thing, much less commit such a horrible crime. 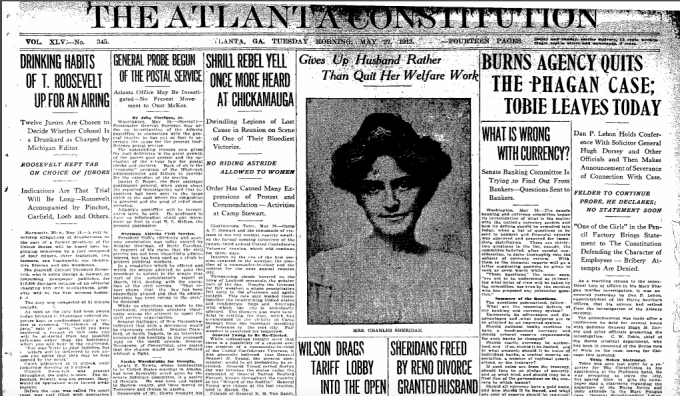 C. C. Sears, superintendent of the Atlanta branch of the Burns detective agency, communicated with Chief Beavers and Chief Lanford Monday afternoon, telling them of the severance of connection with the Phagan investigation, and notifying them that he would mail letters of explanation to the police department some time today. According to Chief Lanford, Superintendent Sears gave as the reason for the Burns action the desire to get out of an unfortunate situation. Tobie, he said, would return immediately to Chicago to resume his duties as chief of the criminal department.